Can I safely eat whatever goes through the x-ray machine? This might be an odd question, but I often take a sandwich or fruit to eat while waiting for the airplane. This means that my food goes through the security x-ray machine. I don't understand much about radioactivity, so I was wondering: Is it safe to eat that food right after going through the security machine? or suffer harmful mutations that can affect ones health? Can it keep some latent/cumulative radioactive effect? Bananas, by nature have a very low level of radioactivity. Does it get increased, for example? Can I safely eat the food that goes through the x-ray machine after the security check? Is it safe to eat food, drink beverages, use medicine, or apply cosmetics if any of these products have gone through a cabinet x-ray system? There are no known adverse effects from eating food, drinking beverages, using medicine, or applying cosmetics that have been irradiated by a cabinet x ray system used for security screening. The radiation dose typically received by objects scanned by a cabinet x-ray system is 1 millirad or less. The average dose rate from background radiation is 360 millirad per year. The minimum dose used in food irradiation for food preservation or destruction of parasites or pathogens is 30,000 rad. For more detailed information on radiation used for food inspection or food treatment, see Title 21 CFR 179, www.FoodSafety.gov, contact FDA’s Center for Food Safety and Nutrition, or contact the United States Department of Agriculture Food Safety Inspection Service. and radiation that can actually make stuff radioactive. XRays are the second kind, ionizing radiation, meaning they may alter some molecules (i.e. the arrangement of atoms), but will not affect the atoms themselves(so no radioactivity is created). The altering of molecules may also happen to the DNA molecule, which is why XRays are kept to a minimum. So the apple sent through the machine might get a mutation, but the chance of that being a problem to the apple are remote, and the mutated apple being a problem to you is virtually nonexistent. Sending old school films through an old school XRay might be a problem for the film (film is coated with molecules that are easily altered, because detecting (visible)radiation is it's job, and old XRays used higher power sources). 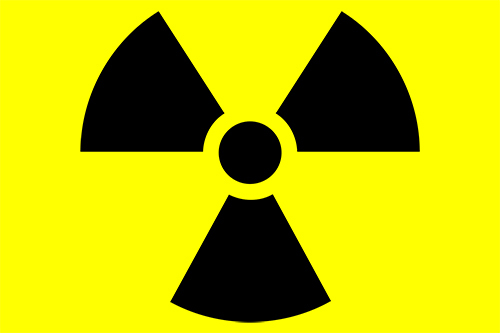 Your association of XRay machines with radioactivity might come from the hazard sign above, that is sometimes quite prominently displayed on Xray machines. It simply warns of ionizing radiation, which can, as stated, damage your DNA, thereby giving you cancer, etc, depending on strength. It's popular meaning of "Danger! Radioactivity" came about because radioactive materials emit ionizing radiation (that's actually why it's called radioactive, the ionizing radiation messes with radio-equipment). So Radioactive materials emit ionizing radiation, but ionizing radiation does not produce radioactivity. Yes, you can safely eat food that's been through the X-ray machine (assuming, of course, that it was safe to eat before going through the nuker). Neutron irradiation. The X-ray machine uses (obviously) X-rays, not neutrons, so this avenue can be safely eliminated. Bombarding it with very-high-energy charged particles. Again, the machine uses X-rays, which are uncharged, so this avenue can also be safely excluded. Conclusion: your food will not be any more radioactive when it comes out of the X-ray machine than it was when it went in. Edit for clarity: photons are the basic units of electromagnetic radiation, such as visible light, X-rays, radio rays, ultraviolent rays, infrared rays, etc., etc., etc.. An electronvolt (eV) is a measure of energy; it is defined as the amount by which the energy of an electron changes when it moves through a potential difference of one volt. A kiloelectronvolt (keV) equals one thousand electronvolts; a megaelectronvolt (MeV) equals one million electronvolts. The more (kilo-/mega-)electronvolts an X-ray photon has, the more energy it carries, and the more damage it can do with that energy. As the diagram makes clear, walking through an airport security scanner exposes a person to about the same ionizing radiation dose as eating a banana. Flying from New York to Los Angeles exposes you to roughly the same amount of radiation you'd get from eight dental X-rays — and less than you'd get living in a stone house for a year. And those peanuts that airlines hand out? They're a little radioactive, too. "Radiation is one example of where people have such a wrong idea about what is dangerous, and are also unaware of its ubiquitous nature," says Barish. "Radiation is all around us. It is in us." There's this handy chart(referenced above) which shows that neither is particularly dangerous on a dosage scale. If you regularly fly on flights passing over the poles, you might need to be more concerned (but even then we're talking LOTS of flights to get a concerning dose). So eat up. There's no danger from the x-ray machine. x-rays are a form of light, just a frequency that your eye cannot see. exposing food to xrays, in any amount, will not make the food radioactive, just like shining a very bright light on your food will not make it shine once you turn the light off. Exposing food to fatal doses of EM radiation (like xrays) is how the US Department of Defense prepares its field rations. This technique has been extensively studied since the 60's by academia and the military alike, and no adverse effects have been found. Not the answer you're looking for? Browse other questions tagged airports food-and-drink airport-security or ask your own question. To how much radiation are you exposed on a transcontinental flight? How can I not get electrically shocked when handling my laptop in an airport? Does Istanbul airport have x-ray scanners before the exit? Can I check in and go through security at DTW the night before a flight? Can you pass through Stansted security any time of day/night? How can one travel with X-Ray sensitive equipment or electronic devices? TSA Security for oversized items?